The official mark of the sesquicentennial was released in October 2018. Aesthetic elements of the City’s sesquicentennial celebration paint a picture of Highland Park’s distinction by commemorating the City’s past, honoring its present accomplishments, and reflecting the City’s future ambitions. The archives yielded a logo used by the City in the late 60s which is both historical and modern and uniquely Highland Park. 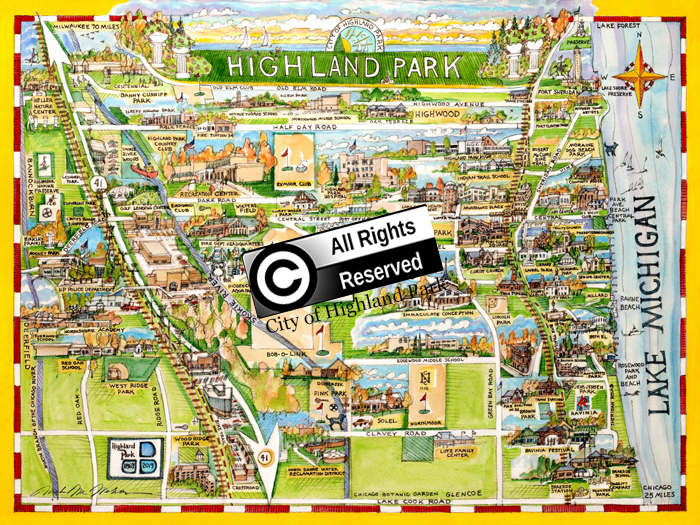 Artistic Map of Highland Park coming soon in the HP150 web store. The City of Highland Park is celebrating its sesquicentennial (150th anniversary) in 2019 with highly visible special events, concerts, City tours and more. Plans are underway for a wide variety of activities which will bring the community together to celebrate the community and its wonderful history. There are a number of ways to get involved with the celebration and make 2019 a year to remember. Tell Us Your Story - have an interesting story involving Highland Park? We want to hear it! Look for details in the Highland Park Landmark coming soon. Participate in the Highland Park History Competition. The Sesquicentennial provides a unique opportunity to reflect on the rich history of the City and bring the community together to move towards a future that celebrates our vibrant city and the people who continue to make it an outstanding place to live, work and play. Individuals, families, businesses, and organizations are encouraged to make a tax-deductible contribution to help fund the multitude of upcoming HP 150 events and programs including art projects, cultural opportunities, service projects, live entertainment, food, and fireworks. The sponsorship deadline has extended to February 15, 2019. Though sponsorships will be accepted after that date, some sponsorship incentives may not be available. - Contributors may attend Dessert with the Mayor at City Hall. - Recognition in the City’s eNews (6,000+ Subscribers). - Two free Highland Park branded items. - Lunch with the Mayor and City Manager. - Public Access Television Interview (aired on Public Access Television throughout 2019 with a copy made for the sponsor). Mayor Nancy Rotering established an HP150 Steering Committee in January 2017 to plan and guide the celebrations of the City and its people. The Steering Committee consists of government officials, community leaders, residents and businesses owners. The City held a public “idea summits” on May 10 and 16, 2017, to encourage communitywide brainstorming. Nearly 200 ideas were generated from the summits. Nine subcommittees consisting of Communications, Art, Architecture, Service, Commemorative Book, the Big Bash, History and Archives, Business and Fundraising prepared work plans and event calendars for 2018-2019 based on ideas generated at the idea summits and during their subcommittee meetings. From these submissions, a Master Work Plan was drafted by City staff, taking into consideration opportunities to combine efforts, avoid duplication of events and programs, cost considerations and event fatigue.